I had taken the week of June 30th of as vacation and intended to bit off a big chunk of the construction. The target was to by July 6th to have the roof on. Well we didn't quite make it! About 25% of the trusses have been installed and another 50% have been loaded up on the walls read to be installed. A second son was unexpectedly called in to work on Saturday. 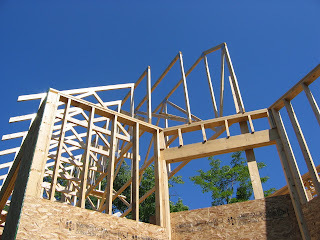 The target for next weekend is to finish framing the roof.